Together with my friends Mike and Julie from England, I went to see the gig in Zaandam. Most of the 2008 Kayak shows that I have seen so far, were in theatres. This time, it was a small but atmospheric rock venue. Here are some photos from the soundcheck and the actual concert (click to enlarge). If you have all Kayak studio albums on vinyl, you still miss a few songs. And even the CD re-releases with bonustracks don't cover everything. Here is an overview of 'special tracks' from 1990 until the present day. I have only included songs that were released officially. * Ivory Dance '94: Not surprisingly, a remake of 'Ivory Dance'. Bonustrack on the 'Eyewitness' CD. 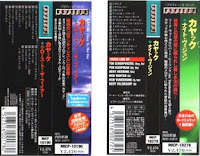 * Cried For Love: Bonustrack on the Japanese edition of the 'Close To The Fire'-album. In 2008, this song was included on the "Anniversary Box". * Love Lies: See 'Cried For Love'. * Merlin Medley: not a song in its own right, this mix of Merlin-tracks was included on the promo CD-single 'Friendship And Love'. * Beat The Clock: Bonustrack on the CD-Single 'Undecided'. * Dear Lover: Only available on the "Fans Choices" CD in "The Anniversary Box" (2008). If you have all Kayak studio albums on vinyl, you still miss a few songs. And even the CD re-releases with bonustracks don't cover everything. Here is an overview of 'special tracks' from the 1980's. I have only included songs that were released officially. * Theme From 'Spetters': Kayak did the soundtrack of this Dutch film. The theme tune was released as a single. The tune can be found on CD: 'Greatest Hits And More' and '3 Originals'. Mind you: the compilation 'The Singles' has a song called 'Spetters', but that is in fact 'Lost Blue Of Chartres' (which was also in the film). * Total Loss: a single from 1980. It was a bonustrack on the original 'Periscope Life' CD. The song is also on 'Greatest Hits And More' and 'The Singles'. * What's Done Is Done: B-side of 'Total Loss'. On CD, this song can only be found on the (hard to find) original CD of 'Periscope Life'. * Monte Carlo Rallye: In 1981, (the management of) Kayak and Earth & Fire sponsored the Dutch Opel Team in the famous Monte Carlo Rallye. A joint single was released, on which Kayak did a version of 'Total Loss' with different lyrics. This version is not included on any Kayak CD! * The Car Enchanters: A promo single from 1981, for Sikkens Paints. The tune of 'The King's Enchanter', but with lyrics about some new kind of car paint. The original single is quite rare, but the song is a bonustrack on the 'Eyewitness' CD. If you have all Kayak studio albums on vinyl, you still miss a few songs. And even the CD re-releases with bonustracks don't cover everything. Here is an overview of 'special tracks' from the 1970's. I have only included songs that were released officially. * Try To Write A Book: Originally a Ten Ride Ticket demo, this became the b-side of the debut single 'Lyrics' in 1973. It is also a bonustrack on the CD's of 'See See The Sun' and 'Royal Bed Bouncer'. * Give It A Name: B-side of the single 'See See The Sun'. Also a bonustrack on the CD's 'See See The Sun' and 'Royal Bed Bouncer'. * Bulldozer: An instrumental demo from 1974. An edited version can be found on the 'Royal Bed Bouncer' CD. 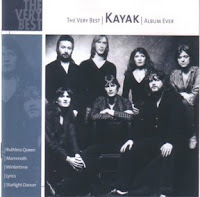 However, the complete version (4:53) is only included on a Dutch compilation CD, 'The Very Best Kayak Album Ever'. * We Are Not Amused: A single from 1975. Included on many Kayak compilation CD's. Also a bonustrack on the CD of the second album. * Boezem: The 'Week of the book' is an annual event in Holland. Book buyers receive a present in the shape of a free book. There is also a special present for the younger people. 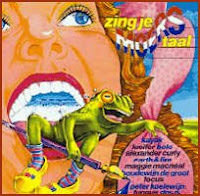 In 1976, that free gift for the youth was an LP called 'Zing Je Moers Taal'. The album was compiled by Holland's best known DJ/presenter, Ad Visser (of 'Toppop' fame). Many well-known Dutch artists performed poems written by Dutch authors. Kayak did a poem by Harry Mulisch. On CD, the song is included on the compilation 'Greatest Hits And More'. * Ballad For A Lost Friend: Same melody as 'Boezem', but with English lyrics. In the USA it was on the 'Starlight Dancer' LP. In Holland, it was released in 1978 as b-side of the single 'Phantom Of The Night'. Included on the CD's '3 Originals' and 'Universal Masters Collection'. * Irene (USA Version): Originally on the USA-LP 'Starlight Dancer', and the b-side of the Dutch 'Starlight Dancer'-single. This USA-verison (is it a demo?) is different from the one on the Dutch LP. It is also a bonustrack on the '3 Originals' CD. * I Want You To Be Mine: The USA-LP 'Starlight Dancer' has this alternate version of 'Want You To Be Mine'. And the CD '3 Originals' has the American version on it, but with some minor differences (probably a different studio outtake?). * Ivory Dance: Instrumental, b-side of the single 'Ruthless Queen'. On CD: '3 Originals' and 'Greatest Hits And More'.